Prior to studying landscape architecture, Ross McGowan completed an undergraduate degree in Sociology at the University of Winnipeg. He continued his studies there, pursuing a Master of Criminology, and intending to work as a parole or probation officer. However, while studying, he worked at Stoney Mountain Penitentiary. While working there, he decided that was not the career he wanted and began looking into other options. McGowan had been interested in studying forestry, which prompted a friend to recommend that he study landscape architecture. McGowan looked into the Masters program at the University of Manitoba, but because he did not have any background in design, planning, or architecture, it was recommended that he get some hands-on experience in the field. McGowan took an unpaid position with Amisk Planning Consultants and worked with the firm on a planning study being done in Pukatawagan, Manitoba. The following year, McGowan applied to the graduate program at the University of Manitoba and was accepted. He graduated in 1980 with a Master in Landscape Architecture. His practicum thesis, titled Richmond Lakes Housing Study: Privacy & Social Interaction at the Neighbourhood Level, looked at the theoretical implications of space and privacy in their relation to the design of medium-density housing developments. Instead of accepting a position at an architecture firm following graduation, McGowan decided to take a chance and work independently on a $1,700-project. One project resulted in another project, and still others. Eventually, McGowan had to hire people to assist him with the work and McGowan and Associates began. Not long after, McGowan’s firm joined forces with Lombard North Group, whose head office was in Alberta. In 1981, McGowan reopened the Lombard North Group office in Winnipeg, which had been closed since 1977. He completed several projects while working for the firm, including the Harbour View Golf Course, the Stephen Juba Park, and the Air Canada Window Park. McGowan also worked on the River Road Heritage Parkway, a popular historic route that follows the Red River in Manitoba. The firm also restored the gardens at Kennedy House, located along this route, as part of this project. 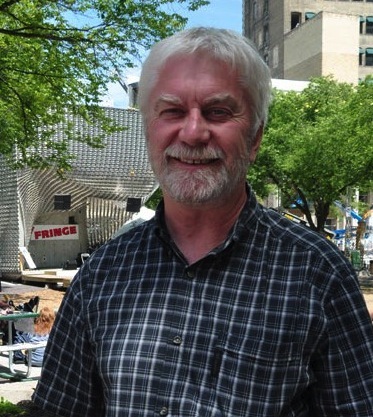 McGowan left his position with Lombard North in 1986 when he was offered the Urban Design Coordinator position in the City of Winnipeg’s Environmental Planning Department. While working for the city, McGowan worked with Ralph Shilling and Doug Patterson on the first master plan for the Forks, a historic site located in the heart of downtown Winnipeg where the Assiniboine River flows into the Red River. McGowan also chaired the technical steering committee and worked on the first environmental reviews of the site. Two years later, McGowan left his job with the city and formed his own firm, McGowan Design Group Incorporated, along with Susan Russell and Ruth Rob. Though the firm would grow over the years, McGowan and Russell both wished to keep it predominately Manitoban based. In the 1990s, the firm, led by McGowan, worked on several important local projects. For example, Winnipeg Transit wished to convert Graham Avenue, a downtown Winnipeg street, into a dedicated pedestrian and transit avenue and they enlisted McGowan Design Group for the project. The streetscape was designed to be bold and urban, with specific light and signage standards. Even though it took the firm several public consultations and meetings with Graham Avenue business owners, the community eventually supported the project. The firm also worked on the Pritchard Farm Properties development, a housing subdivision located in Winnipeg. The lots were arranged around the man-made Eagle Creek and also contained bicycle trails. The development, completed in 1999, has seen a lot of success. In 2007 McGowan was approached by the chair of the board of CentreVenture Development Corporation, an arms-length agency of the City of Winnipeg that is an advocate and catalyst for business investment, development, and economic growth in downtown Winnipeg. McGowan was told that CentreVenture was looking for a new CEO and he accepted the position. McGowan came onto the scene at the same time that city council, led by then Winnipeg Mayor Sam Katz, was considering putting an end to the agency. McGowan managed to convince council of CentreVenture’s importance to the city with his aggressive downtown revitalisation and development-stimulus agenda. McGowan stayed with the agency for seven years and during that time he accomplished a significant amount of work, attracting both positive and negative reviews throughout his term. One of McGowan’s most celebrated projects, and his personal favourite, was the conversion of the Bell Hotel into a 42-room housing complex that offers permanent housing for those who have been homeless. He was also praised for the transformation of Central Park in downtown Winnipeg, which is located in a high-density, low-income neighbourhood. The park now has a soccer pitch, a skating rink, and new lighting. The transformed green space, which was executed by the landscape architecture firm Scatliff+Miller+Murray, has become a great space for the community and has improved safety in the neighbourhood. McGowan, with CentreVenture, also worked on the Centrepoint development. The Centrepoint development began when Liquidation World was going to sign a long-term lease for the former A&B Sound building, located at 311 Portage Avenue in Winnipeg. McGowan believed that allowing this to happen would harm the downtown area. Therefore, CentreVenture, along with Forks North Portage purchased the structure and started the Centrepoint development, which was to include a hotel, offices, and condos. In order to attract businesses and to ensure that the Centrepoint development would be a success, McGowan and CentreVenture established the Sports, Hospitality and Entertainment District, more commonly known as SHED. The 11-block, tax-incentive zone aims to revitalise Winnipeg’s downtown. McGowan retired from his position as CEO of CentreVenture in December 2014 and continues to work as a private developer. In addition to his work, he has been involved in various community initiatives. McGowan is a former president of the Urban Development Institute and has sat on the board for Habitat for Humanity. “CentreVenture Boss Got a Lot Done.” Winnipeg Free Press. December 20, 2014.